My perfect hiking trail is isolated and untouched. It is well-maintained yet offers rugged challenge to my body and my wits. The consummate trail is a secret which few journey. My favorite trail offers unique natural geology, wildlife, and vegetation. It offers enough danger to periodically elevate my adrenaline levels but is safe enough to keep my wife from worrying about me. The Pacific Northwest is brimming with all of the requirements for my too-good-to-be-true trail. 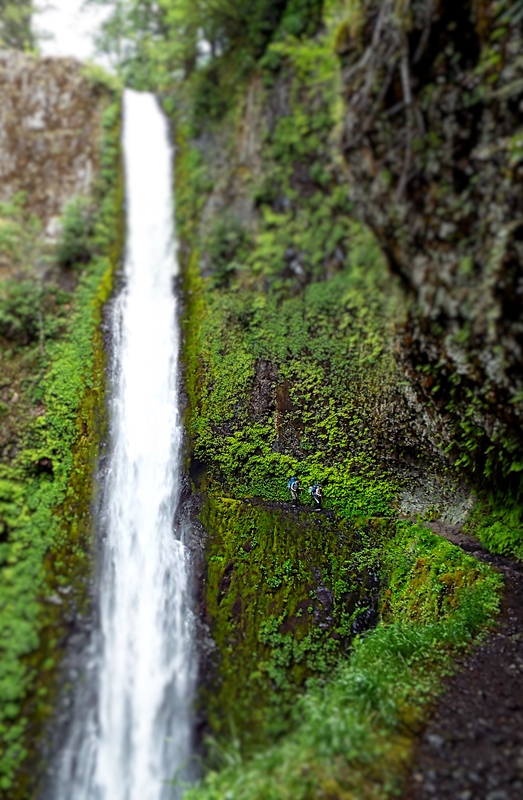 Though they don’t come together on one trail, the cumulative effect of hiking the coastal, mountain, desert, and, of course, the Columbia River Gorge provides me with Utopia. I guess this is why I was so surprised by the condition of the Eagle Creek trail west of Cascade Locks. The trail is known for remarkable natural and human created beauty but it also shows signs of use and abuse. Some of the conditions along the trail relate to its popularity and proximity to a large metropolitan area. (I recently hiked it on a Wednesday morning and encountered over one-hundred others in my 5-1/2 hour journey.) The substantial traffic on the trail, particularly on weekends, shows in its widening footprint and the densely packed surface. of abuse. Two side by side trees have lost bark and been subjected to graffiti reminiscent of an urban underpass or the freight cars that travel the rails along the Columbia River. 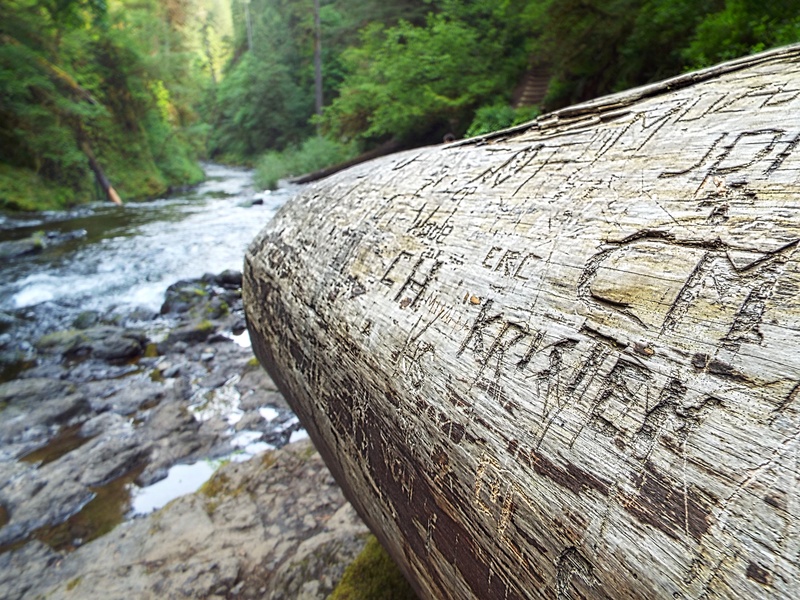 A fallen tree in the basin near Punchbowl Falls, likewise, has been abused. The unsanctioned shortcuts and side trails also reflect this misuse. Despite the magnificence of the multiple waterfalls, the high trail through the the Eagle Creek canyon suffers from unnecessary damage. I don’t know why; I rarely see abuse on the other less-used trails I hike. Most hikers I encounter are diligent in their stewardship of the gift with which those of us in the Pacific Northwest have been blessed. Maybe my ninth grade Citizenship teacher was right. Increasing world population is unsustainable. Maybe the abusive relationship hikers have with the Eagle Creek trail hints at the sociology of population growth. Consider that the human population that journeys and harms this trail is but a microcosm of our relationship with the planet. As our numbers increase we feel bigger and more important than the vast ecosystem that encompasses us. Our attitude becomes more arrogant and human-focused. Nature becomes our playground rather than sacred ground. Is not this the flaw in our thinking that has led us to detrimental climate change? As Earth’s population climbs, we no longer see ourselves as part of nature. Collectively, we cease to perceive our vulnerability. Forgetting our smallness and membership within creation, our self image (self importance?) grows bigger and our humble vulnerability diminishes. We ignore our connectedness to nature and forget the divine command to be good stewards (Genesis 1:26). 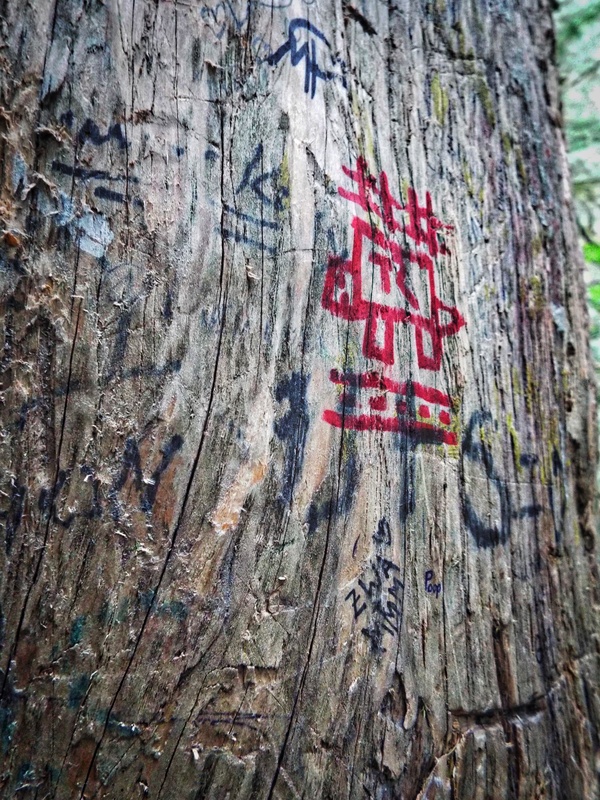 Once we are psychologically disconnected from Mother Earth, it becomes easy to carve our names in a tree or destroy ground vegetation beside the creek, rarely thinking about the impact of erosion when we go off trail. We’re just one person we tell ourselves. No harm from me. Except, of course, we are not one but one-hundred on a weekday and three times that on a sunny Saturday. just one except, of course, we are more than seven billion. It has become easy because we’ve forgotten that we are kindred to the tree, the grasses, insects, and animals. We’ve forgotten that nature is our sister, brother, father, and mother. Of course, neither forgetfulness or denial of our place within the earth is an excuse. Every hiker along the trail and each human on the planet is called by the divine interconnectedness to break with the hive mind of overpopulation. We can and must take personal and collective responsibility for the abuse we’ve inflicted. Eagle Creek Canyon and Mother Gaia cry out in pain from our use and abuse. Will we provide the balm they need? 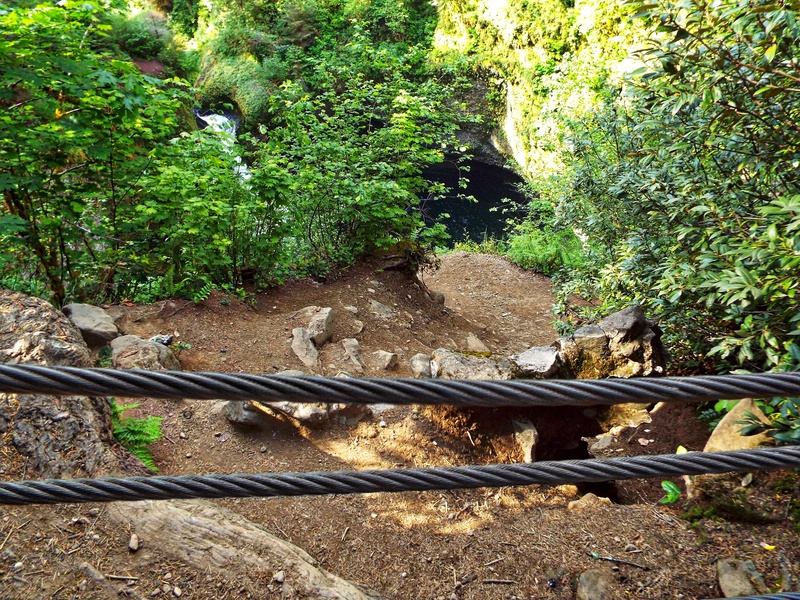 View additional photos and see a video of the human-created tunnel behind Tunnel Falls on Flickr.